We have various pages of Contemporary Japanese House selections with links to hundreds of individual project pages. We aim to select projects that are either of top quality or interesting or ideally both. 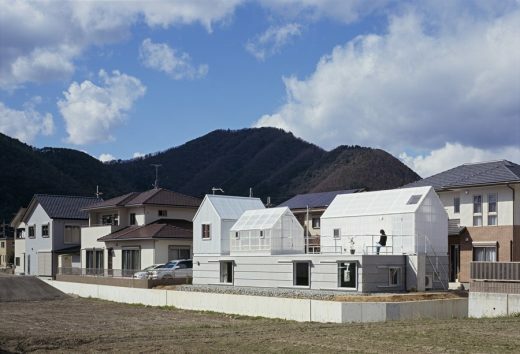 We cover completed Japanese homes, new house designs, architectural exhibitions and competitions across Japan. Comments on the selection welcome. 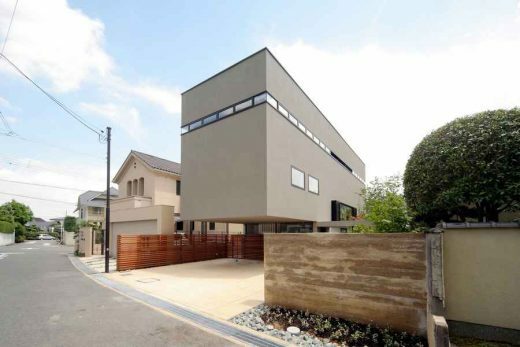 The focus is on contemporary Japanese residential buildings but information on traditional buildings is also welcome. 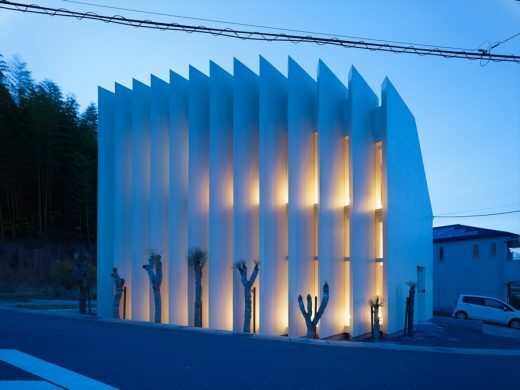 Set in the ‘snow country’ of Niigata Prefecture Japan, Andrew Burns Architecture has completed a gallery, studio and atelier, creating a setting for production and exhibition of work by Australian artists in collaboration with local community. 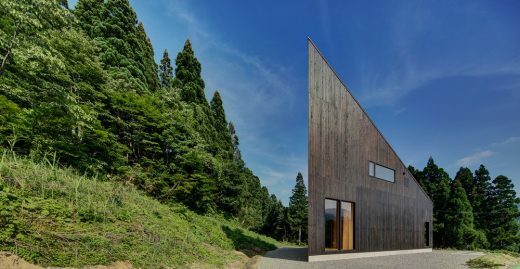 This vacation home on Japan’s northernmost island of Hokkaido sits on a bluff with a view of Mt. 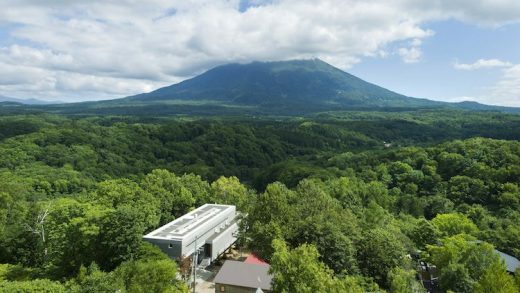 Yotei (also called Ezo Fuji for its resemblance to Mt. Fuji), overlooking a river that meanders slowly along the base of the mountain. The structure cantilevers out over the bluff as if to float amidst the surrounding nature. Its name, The Clearwater, is derived from the pure snowmelt from Mt. Yotei that flows in the river below. The solution arrived at by the architects was to build out as close as possible to the neighboring houses, tracing the silhouette of the previous structure, but to also carve out small gardens on three sides. 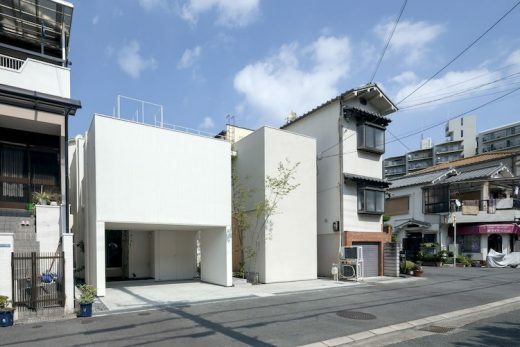 The site is located in North Eastern part of Osaka prefecture, where its surrounding neighborhood in mature residential quarter remains quiet, even though it is just a little away from a main road. 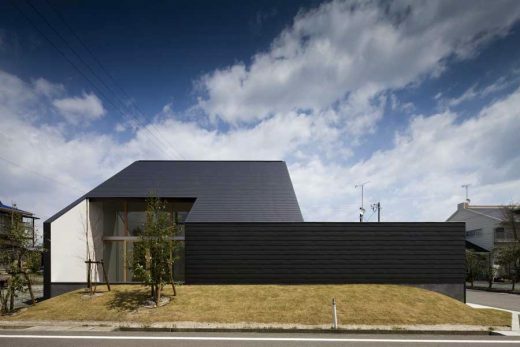 This is a project to design a small house for three adult residents – an elderly couple and their grown up child. 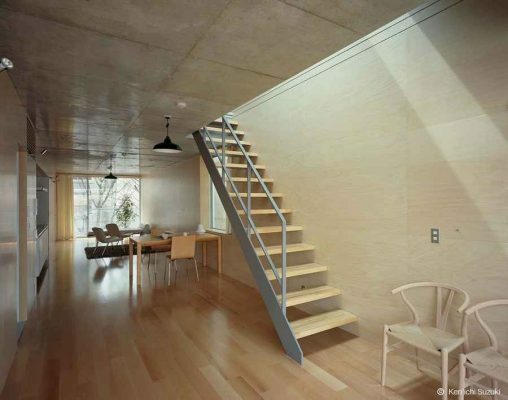 A mezzanine-floored residence consisting of a single-roomed space, located on a fan-shaped site. The request from the client was “a house that can feel the resort feeling”. In order to look at the beautiful scenery, the architects created terraces at residential buildings and shops and direct the resort. 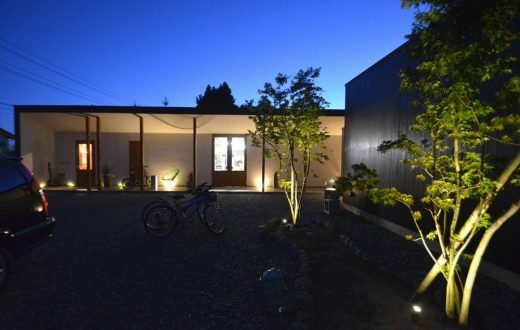 The outer wall is cedar boarded and has a calm finish according to the surrounding environment. 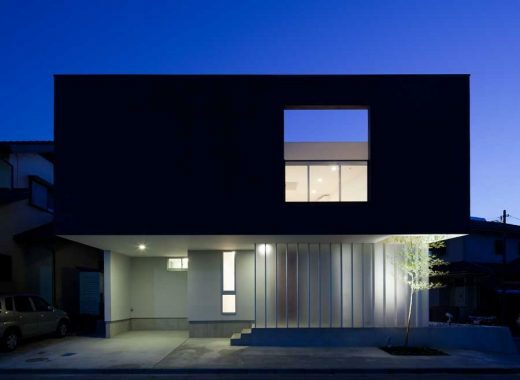 Located in a terraced residential district, the lot for this project was half flat and half sloping. Nearby is Odawara Castle, built in the 15th century. The property looks down on the neighborhood that grew up around the castle, and beyond that Sagami Bay and Enoshima island in the distance. 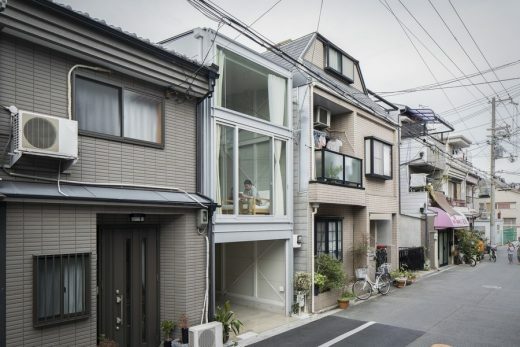 This Japanese residential building consists of a two stories high rectangular box with a meter deep balcony, which functions both as a semi-outdoor corridor connecting the rooms on the upper floor, and as a roof over the ground floor entrance porch and veranda. 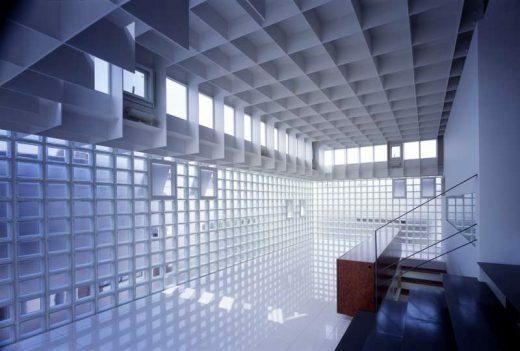 The expanded metal stair connects each floors and spreads the sun light inside. 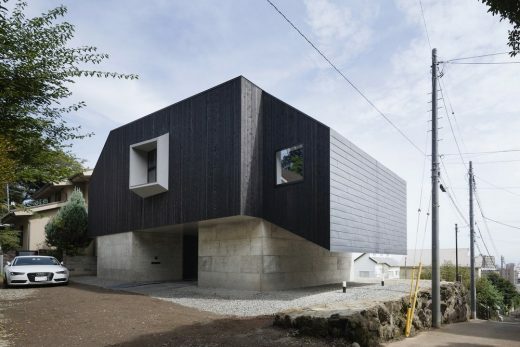 In this house, occupants are living like birds swinging from branch to branch. 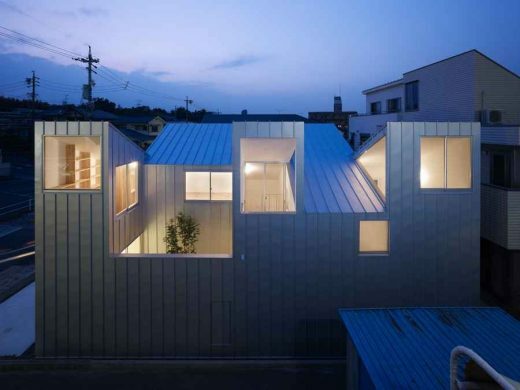 This is a two-story weekend house with a rooftop deck near Tokyo. 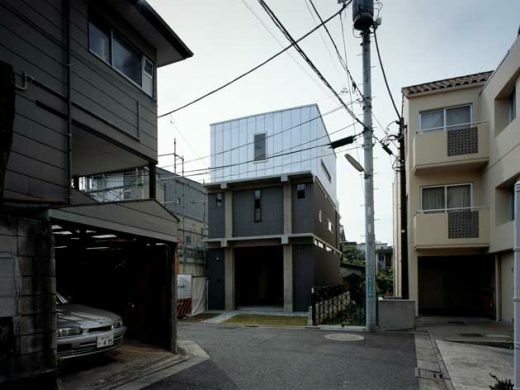 The house is structured in order for the owner, a photographer based in Tokyo, and his family to fully enjoy the environment during the weekends. The house includes several points that can help refresh their minds after their busy work week. At the entrance, they have the options to go directly to the living room or to take the stairs to the rooftop deck. 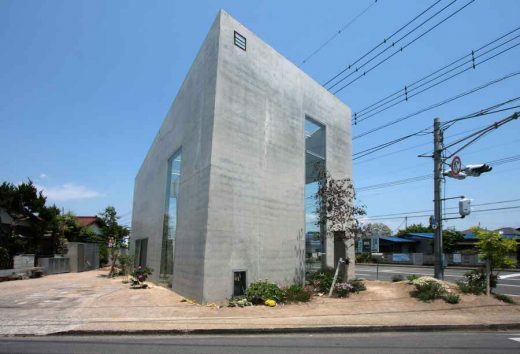 This project is a residence for a couple in their thirties, built in Abiko City. 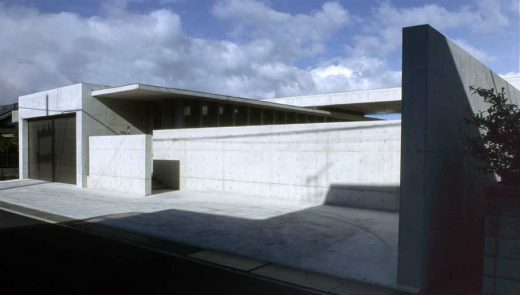 The client desired a gallery-like concrete-made space where their pleasure of designed furniture stands out. 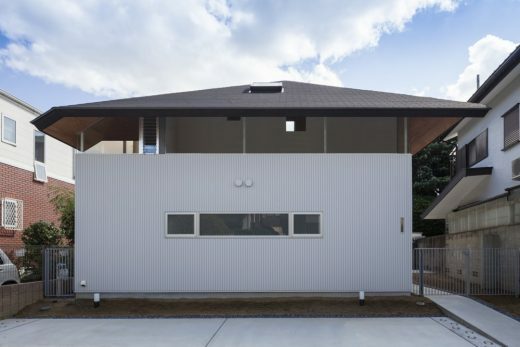 This is a house in the northern part of Hyogo Prefecture for a couple and their two children. The construction site is a part of a place surrounded by mountains and the sky is overcast most of the days. I wanted to create light, stable indoor climate and came up with a plan of three sheds of house type arranged on a 1.8 m high, grey foundation platform. 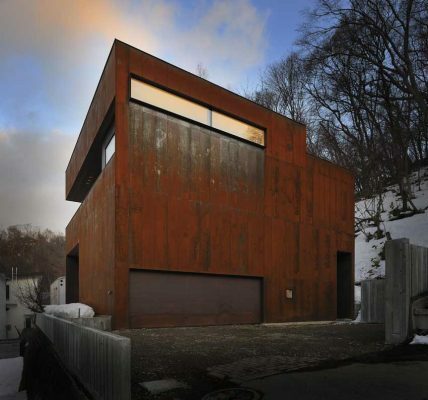 Stunning new Japanese house that floats out over a steep slope. The architects describe it like this: “The owner spent quite a few years for found this site, therefore my main concern was to link the beautiful vast sea of trees spread out to Mt. Asama (Asamayama in Japanese) with internal space. First of all, we can enjoy a sea of trees from the approach deck to the entrance. When open the large door to the living room, Mt. Asama and the foot of it spread in picture window frame formed by the deep and low-height eaves. This scenery is the best part of the view”. The site is located on south-west area of on Kichijyoji train station facing a beautiful Zelkova street which runs through Inogashira Park in a direction perpendicular to Inogashira street which is one of major streets in Tokyo. Considering rebuilding the decrepit office building, the complex building which was consisted with the office, shops and rented apartment was organized to be suitable for the context. The deformed volume was lead by a north diagonal restriction and sun shadow control. 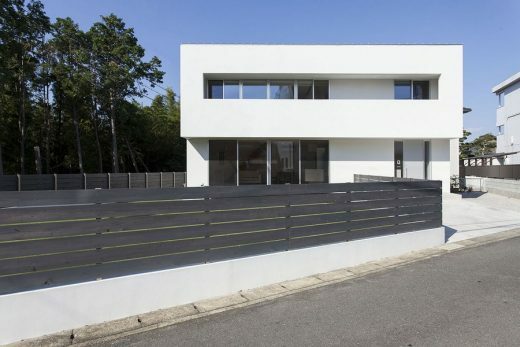 This residence is planned for a family, husband, wife and their son. The client family of this house needed many small rooms within a relatively small space. So, the architects firstly examined the possibility of a row of small, deep rooms. After the concept was fixed, the architects considered different widths depending on suitable scales for each of the rooms. Then they edited the composition of the sections. Located in suburb area, House in Yotsukaido is a residence that looks to merge the boundaries between private interior space and the context. 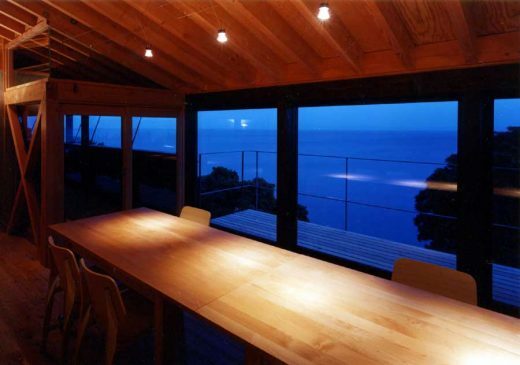 A non transference glass terrace connects to the home. Thick walls surround the outdoor area, shielding the owner from outside eyes, while maintaining a sense of exposure to the nature. a single square opening cuts through the enclosure, framing a nearby retention basin and the neighborhood beyond.